Today started rather damp and soggy. I had been hopeful when leaving home where we had glorious sunshine that it would be the same an hour up the road but the closer I got the greyer and colder it got and I was eternally thankful I had packed layers and most importantly wellies. A small power slide in the mud but the trusty focus got us in and parked and off I went to the showjumping of the CIC***. It was already a vast improvement on last year’s weather where the fog was so thick you couldn’t see from one side of the arena to the other never mind see the palace in the background. 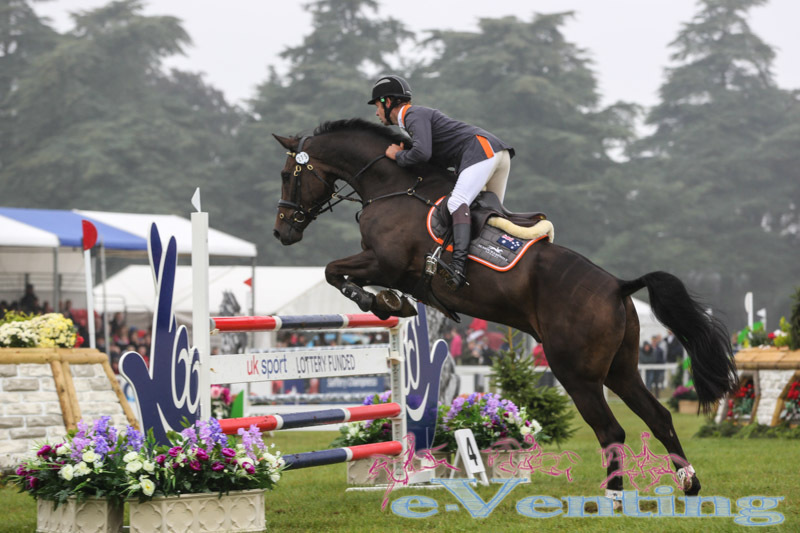 The drama started early but not due to the jumping itself but due to two riders falling foul of FEI regulations regarding hind boots for young horse classes. Hind boots must weigh under a certain weight and be completely plain for these classes and riders apparently had been reminded as such in the rider briefing but William Fox Pitt and Sam Griffiths fell foul of the rule and were eliminated, this must have been particularly frustrating for William whose clear round on Freddie Mac would have otherwise left them in 3rd place after showjumping. 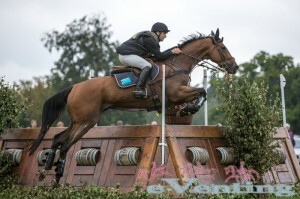 The jumping course itself caused its fair share of problems with poles falling all around the course on a regular basis not helped by a tight time allowed. 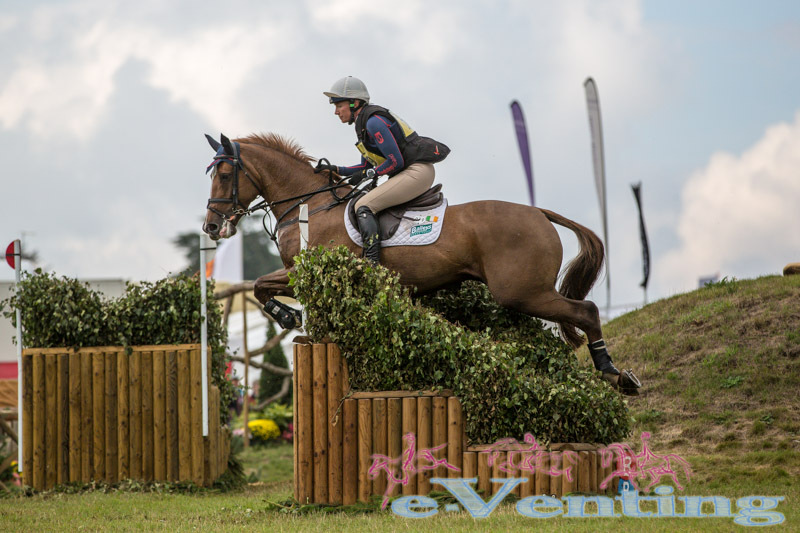 Only 14 out of 64 riders managed a clean sheet with several others leaving up the poles but picking up time faults. The ground was really on the soft side after the over night rain meaning the arena party were regularly stamping in divots. A combination facing into the crowd off a dog leg turn caught out a large number who didn’t ride the curving line properly so finding themselves on an angle to the first element and then struggling to straighten for the remaining elements. Those who achieved clears were rewarded with a good leap up the leader board, Bill Levett and Kevin McNab both find themselves now in the top 10 and William Fox Pitt on his second ride Fernhill Pimms leap frogged Chris Burton on Graf Liberty who dropped a pole to take top spot over night. After the CIC*** showumping was completed the arena teams leapt in to action clearing the arena in preparation for the CCI*** cross country. From the start it became clear it was most certainly never going to be a dressage competition. 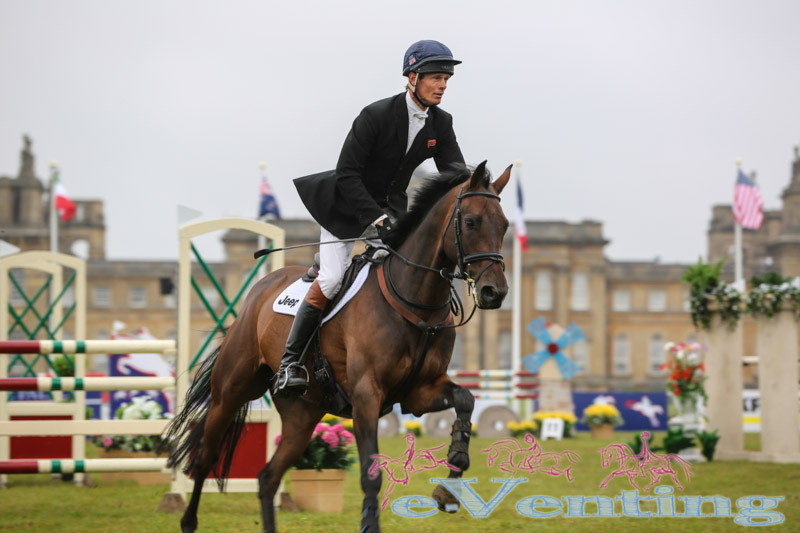 first on the course William Fox Pitt riding Before Time looked on for a good round before falling at the double of stone houses just 3 from the end. The double of hedge corners at 5 though quickly became evident as being the bogey fence on the course and throughout the day they claimed no end of scalps. The first hedge positioned at the top of the hill down to the water had to be ridden on a very exact line, the slightest deviation in the approach and a run out was inevitable. There was no alternative to the first element either which led to a large number of retirements after horse after horse struggled to read the question properly. Apart from fence 5A faults were spread round the entire course, William Fox Pitt’s second ride in the CCI*** Running Order took a dislike to jumping into the water and after 2 stops William retired. 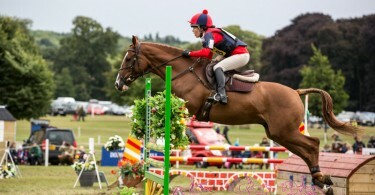 He wasn’t alone though and Emily Parker riding Treefers also picked up 20 penalties here before later retiring. Overnight leader Sarah Bullimore on Lilly Corinne had been flying round the course before picking up 20 penalties in the latter stages. Toshiyuki Tanaka was almost certainly left kicking himself in frustration after falling at fence 2 a large but fairly innocuous table fence that featured in last year’s Olympic course. The dew pond caused a notable amount of issues with horses running past or stopping at the very skinny triple brush on the way out, this resulted in a large proportion of the latter riders taking the longer route to a slightly wider skinny although this didn’t help Pippa Funnell whose Or Noir De La Loge didn’t lock on coming round the mound to the skinny and ran past. As the day progressed it also became apparent just how tight the time was. The course at Blenheim is extremely hilly in areas and also quite twisty through the wooded sections so is often quite tight but with the ground slightly holding after the rain (the ground had been pretty much perfect if not on the soft side in places before the deluge commenced overnight) it became almost impossible to get inside. 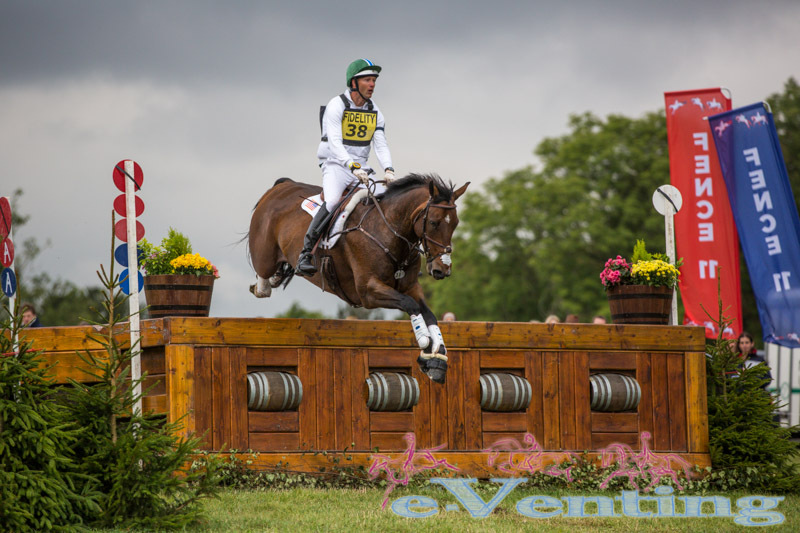 You know the time is tight when even the maestro himself Andrew Nicholson cannot get inside, albeit he had a stop but still picked up 12.4 time penalties. For a long time it looked like no one would get inside until Gemma Tatterstall the penultimate rider on course stormed round clear inside the time to propel herself up the leader board from 22nd to 4th! 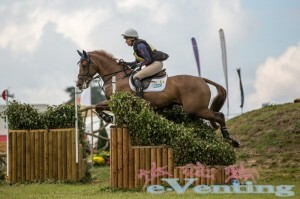 In total of the 83 to start XC only 61 completed and only 33 were clears but relatively speaking this was without incident with as far as I’m aware no injuries to horses nor riders. I must admit I was slightly amused to meet the on duty life guard complete with flip flops at the second water crossing. 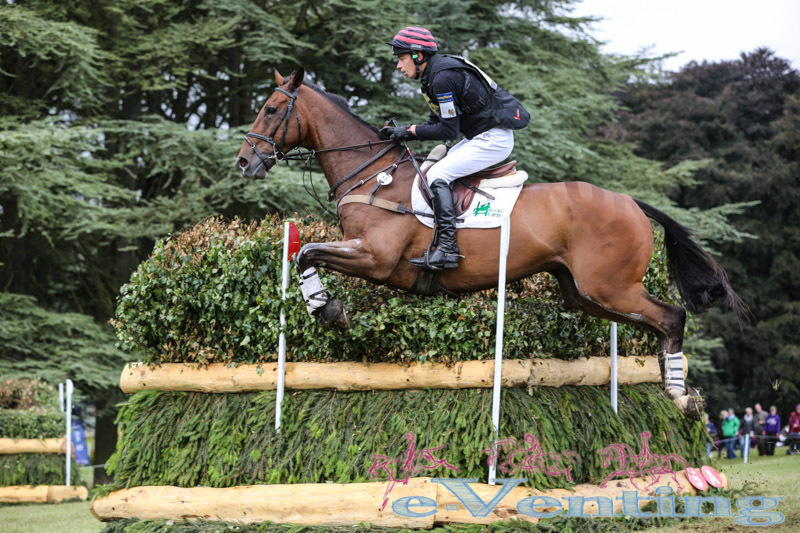 He was very pleased to have an uneventful day as apparently he tested the water before the XC commenced and confirmed it was freezing cold! 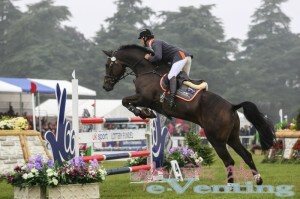 Michael Jackson proved a good sport in the Masters Gate jumping competition to jointly win over 5ft8. We couldn’t help but admire his excellent tan! The leaderboard has been shaken up quite violently with only 4 of yesterday’s top 10 remaining in the running. Aoife Clark riding Fenyas Elegance has taken top spot overnight after adding only 4 time penalties to her excellent dressage score of 40, leaving her just 1.5 penalties ahead of Jean Teulere and Clark Montgomery who are both on 45.5 although Jean sits ahead of Clark by virtue of being 1 second closer to the optimum time today. In addition to Gemma’s aforementioned meteoric rise Tim Price and Lucie McNicol have also climbed rapidly from =30th to 7th and 8th respectively. 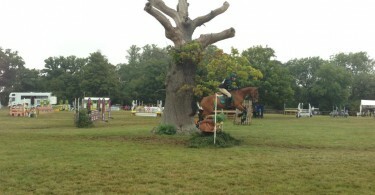 The day did not finish there though with the Masters Gate Jumping Challenge rounding off the day excellently. Essentially the invited Hunt Masters in turn jumped a single rustic gate which went higher and higher each round. In the event the gate was knocked down the riders had the option to buy a life by removing a piece of clothing. 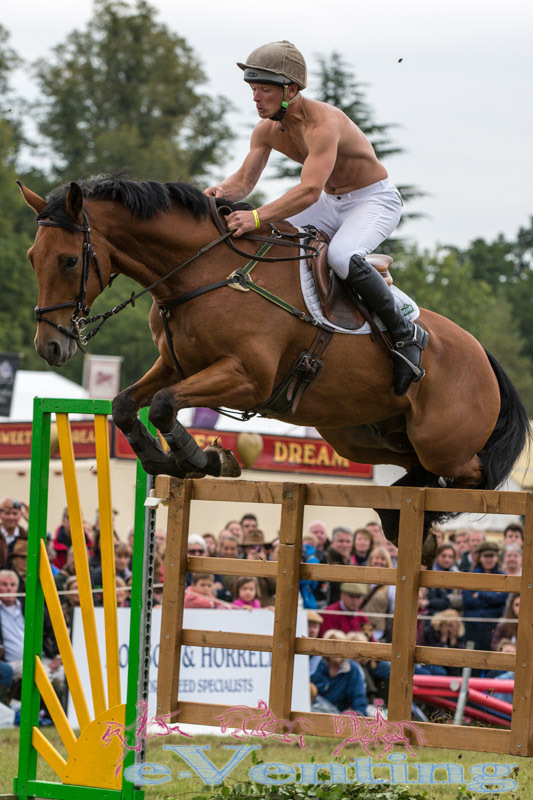 This proved excellent viewing and much to the crowds delight several of the male riders ended up shirtless though ultimate joint winner Michael Jackson who cleared 5ft8 along with Alice Dunsdon was the star of the show and I think the photo will explain quite why!! The forecast for tomorrow is showers and if correct I foresee the leaderboards once again being shaken up. 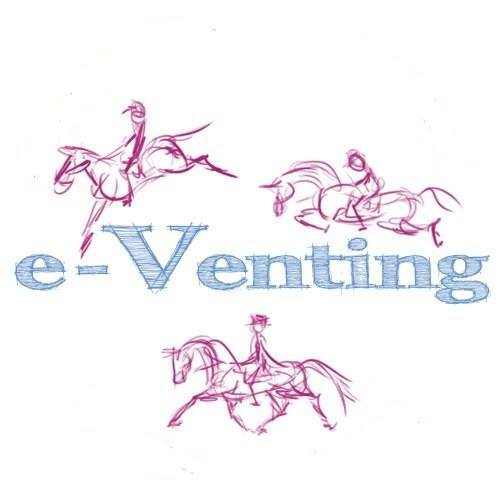 Today has been true eventing horses and riders have been tested without putting them at risk. A special mention should also go to the large number of excellent volunteers and officials who ensured a well run day. Following on from the recent incident all crossing guards were taking particular note of cars and holding back pedestrians and ushering the cars through. Excellent job guys a well done well deserved. I will be back tomorrow and am looking forward to what will without question be another exciting day of competition. Thanks for the write up, good to stay up to date!